This refreshing and brightly coloured Persimmon Avocado Kale Salad is gorgeous, healthy and just perfect for the holidays. Persimmons are in season right now and I cannot get enough of them. The subtle sweetness of the persimmons works really well with the slight bitterness of the kale. I just love the fresh taste and feel of this salad: crispy pomegranates, refreshing persimmons, crunchy fennel, creamy avocado, fresh goat’s cheese and a zesty, slight sweet lemon-honey dressing. If you are not eating dairy, you can easily leave out the fresh goat’s cheese. The avocado already adds a lovely creaminess to this salad. 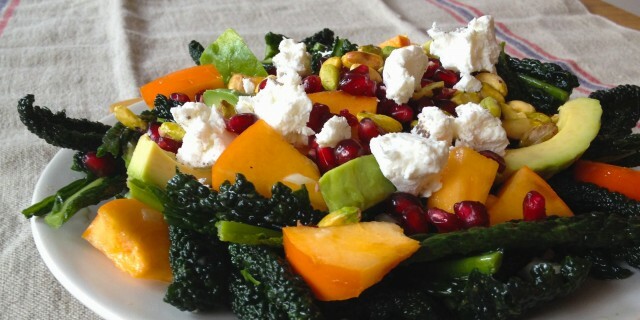 This Persimmon Avocado Kale Salad bursts with simple but beautiful flavours. Persimmons are wide available in stores right now. Give it go. I am pretty sure you will fall in love with this salad too! Add the kale to large bowl and add the salad dressing, massaging it into the kale using your hands. Add the persimmon, avocado, pomegranate seeds, fennel and pistachio nuts. Crumble fresh goat’s cheese on top. 2 Responses to "Persimmon Avocado Kale Salad"
Made this salad today. Delicious! Even my daughter loved it, a good way tot get healhy food in her!